Comino Couture polka dot mustard two piece set. Every day’s a runway in this two piece featuring ruffles and dots. The top is cropped fit with ruffle v front and back, one sleeve asymmetric style, pretty front mustard buttons with vintage look collar. The skirt is asymmetric ruffle hem with under net for a kick out and come with little black belt to accentuate the waist. Perfect partners but equally fabulous as individual pieces too. Rebecca Rhoades Brandy blouse platinum jungle print choker tie. This blouse is the perfect partner to you skinny jeans or leather leggins. It has a relaxed oversized look, so whilst looking fab covers all the bits you want to hide. Features full sleeves with elastic cuffs loose fit with v neck line and contrast colour neck tie. Exquise black lace Victoriana blouse. Features sheer lace effect with Vicorian style collar and gold embroidery detail. Exquise sequin trousers. Fully sequin cigarette style trousers with side pockets. Exquise ivory shell top. Features cold shoulder split top with sequin and crystal embellished shoulder detail on a rounded shell style fit. Leilou frill top. Features high round neckline with short sleeves and frill front detail. No zips – boxy fit that can be worn in or out. 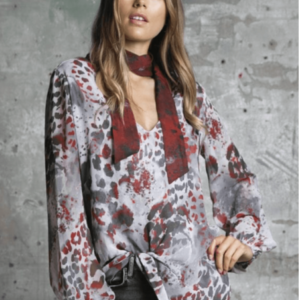 Forever Unique Ola blouse. Beaded ivory blouse with long sleeves and round neck. A perfect blouse to team with any style of trousers, the blouse is lined and looks great with leather pants as shown.